Mary Meeker just dropped some serious gloom and doom on the retail sector. Meeker, a partner at venture capital firm Kleiner Perkins Caufield & Byers and a former longtime Morgan Stanley analyst, delivered her annual influential tech trends report at Recode's Code Conference on Wednesday. In the report, Meeker predicted that nearly 7,000 retail stores will close in 2017 due to the shift to shopping on places such as Amazon (AMZN - Get Report) . To be sure, Meeker has reason to be gloomy. 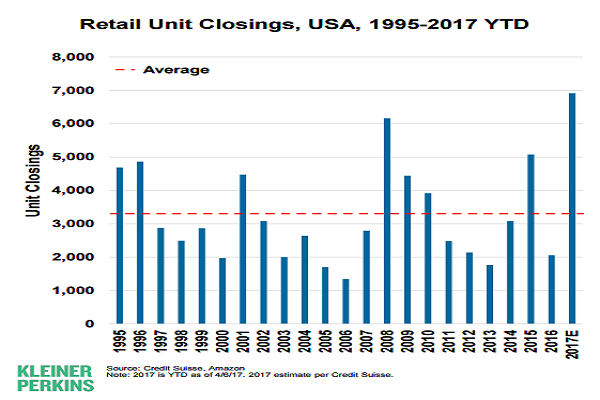 Mary Meeker's projections on store closures. Fellow department stores Macy's (M - Get Report) and Sears Holdings Corp. (SHLD have continued to close stores in droves amid the shift to online shopping. Editor's Pick: Originally published May 31.